Received 10 July 2009; revised 2 September 2009; accepted 5 September 2009.
the perspective of the Belgian health care payer. and prevents organ damage caused by infections . muscular, intravenous or subcutaneous route. 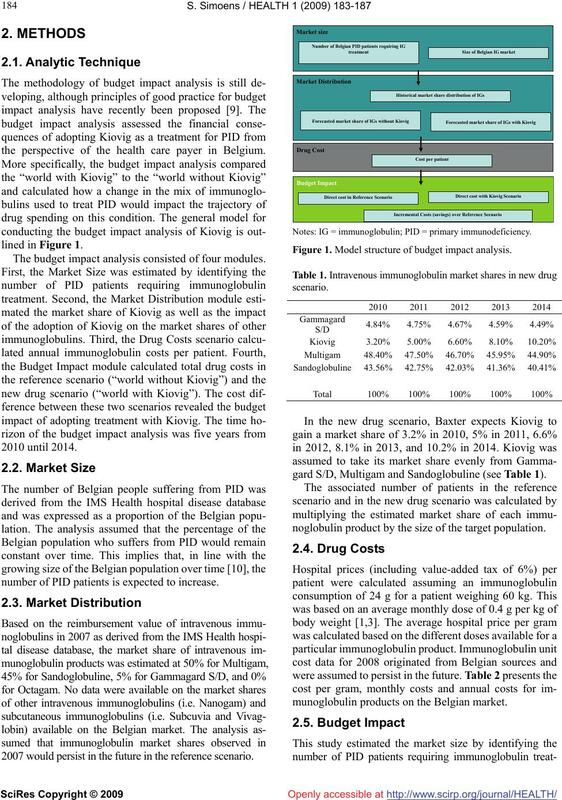 European Union for Kiovig in January 2006 .
the perspective of the health care payer in Belgium. The budget impact analysis consisted of four modules. number of PID patients is expected to increase. 2007 would persist in the future in the reference scenario. Notes: IG = immunoglobulin; PID = primary immunodeficiency. Figure 1. Model structure of budget impact analysis. gard S/D, Multigam and Sandoglobuline (see Table 1). noglobulin product by the size of the target population. 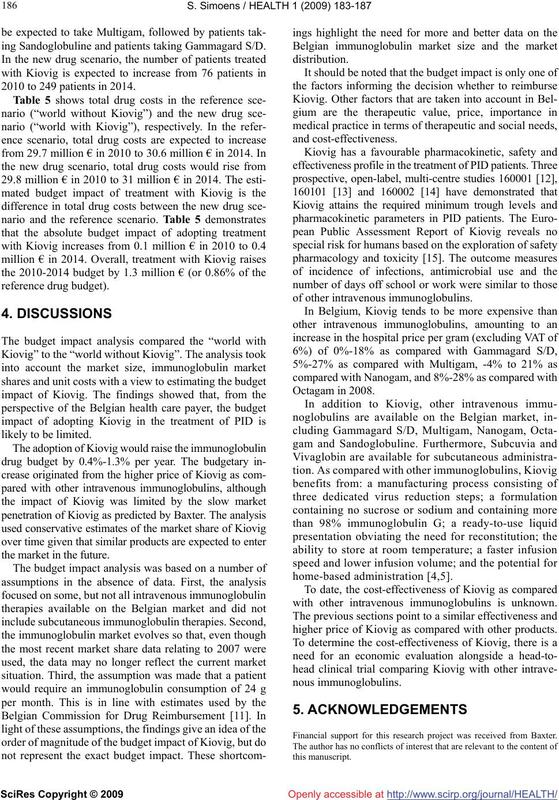 munoglobulin products on the Belgian market. Table 2. Intravenous immunoglobulin costs per patient in 2008. Table 3. Estimated target population. Table 4. Estimated patient numbers. Table 5. 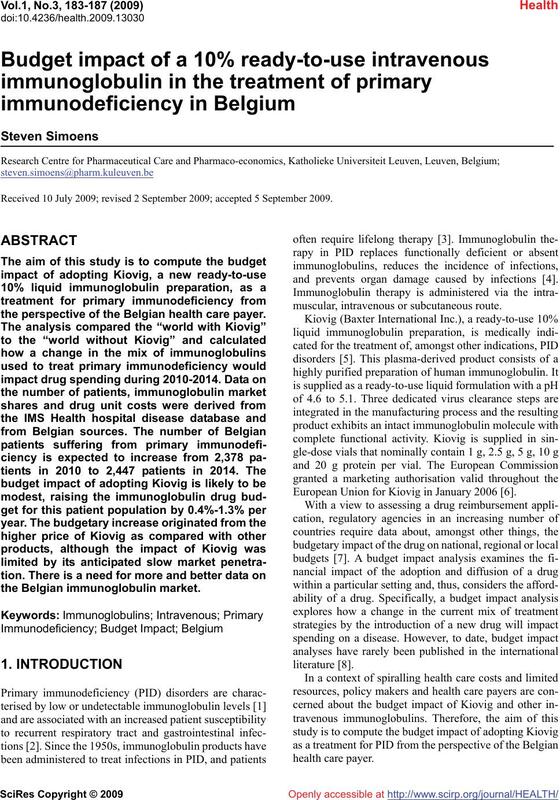 Budget impact of adopting Kiovig. taking that product with the annual cost of that product. ence scenario and in the new drug scenario (see Table 4). ing Sandoglobuline and patients taking Gammagard S/D. 2010 to 249 patients in 2014.
the market in the future. with other intravenous immunoglobulins is unknown. higher price of Kiovig as compared with other products. Financial support for this research project was received from Baxter. 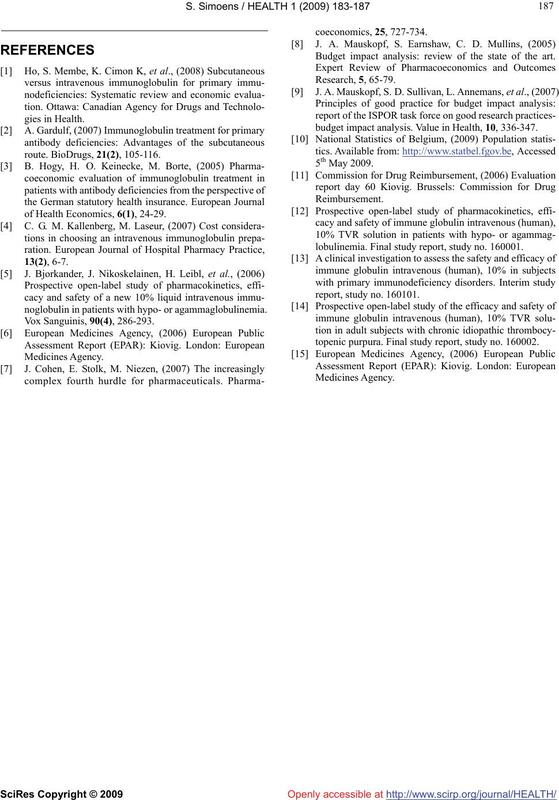 of Health Economics, 6(1), 24-29.
noglobulin in patients with hypo- or agammaglobulinemia. Budget impact analysis: review of the state of the art. budget impact analysis. Value in Health, 10, 336-347.
lobulinemia. Final study report, study no. 160001.
topenic purpura. Final study report, study no. 160002.